The right to social security and the shared benefits of society's progress. You can support the Declaration of Human Rights at this anniversary by signing a personal pledge to the United Nations. Amnesty International already has 3 million signatures worldwide, and is aiming for 8 million. You can even sign up on-line. If you want to add your name to the pledge, send an email to udhr50th@amnesty.org.au. Put your name in the "subject" space, and the following text in the "message" space: "I support the rights and freedoms in the Universal Declaration of Human Rights for all people, everywhere." Recession Watch. The social fallout from the sudden unravelling of economic fortunes in Asia is exceeding initial forecasts and risks dramatically worsening, according to a new report published last week by the International Labour Organisation (ILO). The report, entitled "The Asian Financial Crisis: The challenge for social policy" warns that the deepening economic and social troubles in the region are unlikely to be reversed in the near future and urges governments and policy-makers to take unprecedented emergency and long-term measures, especially establishing unemployment insurance for the mounting number of newly unemployed. In light of the severity of the crisis, the report's author, ILO economist Eddy Lee calls for solutions that will require "an unusual degree of flexibility in policy making on the part of domestic and international actors, including increased social spending, which may prove unavoidable if countries are to undertake credible efforts to reform and alleviate the worst social aspects of the crisis ..."
Lee: "Just as the Depression in the 1930s forged a new social contract in industrialized countries in the 1930s, so must the current Asia crisis serve as an impetus to creating a more socially oriented model for development ..."
The report says that only a small proportion of Asia's needy will be helped by relief through public employment-creation schemes. In Thailand, only 7% and in Indonesia (at best) only 10% of the unemployed can expect to obtain a job in these schemes. In contrast, approximately 24% of the unemployed in the Republic of Korea are able to count on this form of public assistance. The report finds that one in every five formal-sector jobs in Indonesia has been wiped out this year alone, shattering decades of progress made toward modern, industrial employment in that country. Shattered also were the lives of 4 to 5 million Indonesian workers and their families. An additional 20% of the Indonesian population, approximately 40 million people, is expected to fall into poverty this year. In the Republic of Korea, one in twenty workers lost their jobs during the nine month period from November 1997 to July 1998 and unemployment in the country is expected to increase threefold, from 2.3% to 8.2%. An estimated 12% of the Korean population is expected to sink below that country's poverty line this year. In Thailand unemployment levels are forecast to triple from 2 to 6% this year, with partial information indicating a rapid acceleration in the rate of job losses in the last three months. As access to jobs and income dry up, it is estimated that 12% of the Thai population will sink into poverty this year, adding significantly to the nearly 16% of Thais already living in poverty. In Hong Kong, China, unemployment rose from 2% to over 5% in the first three quarters of 1998, an estimated net loss of some 75,000 jobs. In Malaysia, unemployment levels are expected to double to 5.2% by year's end. However, both Hong Kong and Malaysia dipped into recession only this year, indicating a relatively rapid rate of job losses in a comparatively short period of time. Source _ ILO Press Release 2nd December 1998 ILO/98/42 "ILO Calls for more "Socially Oriented" Model of Development as Job Losses Mount, including Establishment of Unemployment Insurance"
The right to work, to a fair wage, and to join a trade union. Back here in NZ, the Government admits it will deduct $21 a week from the benefits of Community Wage workers over the Christmas period if their sponsoring organisation closes for the holidays. MP Rod Donald complains that this is "penny-pinching to the extreme". Donald asks the government to reconsider this "heartless deduction" of the participation allowance over the holiday period: "At the very time of year when every extra dollar makes a difference, the government plans to cut their income. Their Scrooge mentality will leave many beneficiaries without Christmas dinner or money to buy presents for their children ..."
Donald also points to the Community Wage travel costs reimbursements as another example of "a penny-pinching attitude." Donald: "The mileage allowance for Community Wage workers is calculated at only 20c per kilometre. This compares with the 62c a kilometre paid to members of parliament. Participants aren't even allowed to count a detour to pick up other participants ..."
"Obviously the government believes the poor deserve only a third of the travel reimbursement they are happy to pay themselves. The effect of this policy is that Community Wage workers are running their vehicles into the ground for the privilege of working for their dole..."
"Human Rights" is at the centre of a "Legal Resource Handbook" produced by UUI Action NZ, an activity of the Universal Income Trust based in Nelson. The handbook compares the current rules of the government's "work for the dole" scheme with the rights enshrined in the International Declaration of Human Rights, the International Covenant on Economic, Social and Cultural Rights, and the standards of the International Labour Organisation. Researcher Patrick Danahey says that government has implemented a "compulsory labour regime" as a solution to an economic/unemployment crisis in NZ. Danahey: "In the process, it has greatly undermined fundamental human rights and international laws in its adoption of this programme through the recent systematic modifications of the Social Security Act ... Most government agencies as well as the judiciary are still unaware of these recent law changes. it is up to individuals and groups to see that we educate people about these changes ..."
The WAITAKERE electorate contains 18,510 households, of which 32% have household incomes below $30,000 per year before tax. That 2% is 28% below the rate for the country as a whole. There are34,380 adults aged 20-59 in the Waitakere electorate, of whom 64% are in paid, full-time work. Another 11% are in part-time work. Unemployment in the electorate is 2% below the national average. ( Electorate statistics compiled by Judy Reinken, and based on 1996 Census). With the "welfare" debate centering almost exclusively on the rights and responsibilities of the out-of-work and people living in poverty ... our Media Watch reports an increasing spotlight on the concept of "corporate welfare". This refers to the benefits that local and national governments give to corporations, or in some cases whole industries, which are not given as a right to others. Perhaps it is not before time. Ralph Nader first coined the term in 1956 when he pointed out that US corporations collect more government handouts than all of that nation's poor families combined. In 1994, according to a study compiled by Nader's Center for the Study of Responsive Law, the federal government spent some $167 billion on corporate tax breaks and handouts an average of $1,400 per taxpayer. By contrast, the total price tag for Aid for Families with Dependent Children (AFDC), food stamps, public housing, and other "social welfare" programs came to just over $50 billion, or $400 per taxpayer. Time magazine has just completed a special three-part investigation into Corporate Welfare in the United States ("What Corporate Welfare costs you" based on 18 months research by Donald L Barlett and James B. Steele). It says that two years after the US Congress reduced welfare for individuals and families, this other kind of welfare continues to expand, penetrating every sector of the US economy. Time's conclusion: "It has turned politicians into bribery specialists, and smart business people into con artists. And most surprising of all, it has rarely created any new jobs..."
The rationale to curtail traditional welfare programme to the poor has recently been compelling: the old system is clearly not working, it destroys incentive and perpetuates dependence and distorts the economy. But Time says the same indictment, almost to a word, applies to corporate welfare. And it is much more expensive. The Time investigation points out that the economics of such partnerships seldom adds up. Example: In 1997, Pennsylvania gave $307m in economic incentives to a Norwegian global engineering company to reopen a disused shipyard and employ 950 people. The subsidy worked out at $320,000 per job. If the average Philadelphia job pays $50,000, and each worker pays $6,700 in local and state taxes ... then it would take nearly a half-century of tax collections from each individual to earn back the money granted to create his or her job. The rationale for all this corporate welfare is that the government "is creating jobs". The projects are usually trumpeted as "economic development", or "enterprise zones" or "public/private partnerships". Time estimates that 10 million new jobs have been created in the US economy since 1990. But small and medium-sized companies have created most of these jobs. The Fortune 500 companies, on the other hand, have erased more jobs than they have created this past decade, and yet they are the biggest beneficiaries of corporate welfare. 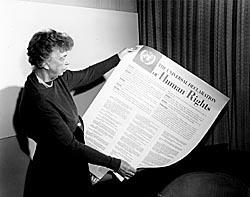 "Where, after all, do universal human rights begin? In small places, close to home so close and so small that they cannot be seen on any maps of the world. Yet they are the world of the individual person; the neighborhood he or she lives in; the school or college he or she attends; the factory, farm, or office where he or she works. "Such are the places where every man, woman, and child seeks equal justice, equal opportunity, equal dignity without discrimination. Unless these rights have meaning there, they have little meaning anywhere. Without concerted citizen action to uphold them close to home, we shall look in vain for progress in the larger world ..."
Seasons Greetings and all the best for 1999!